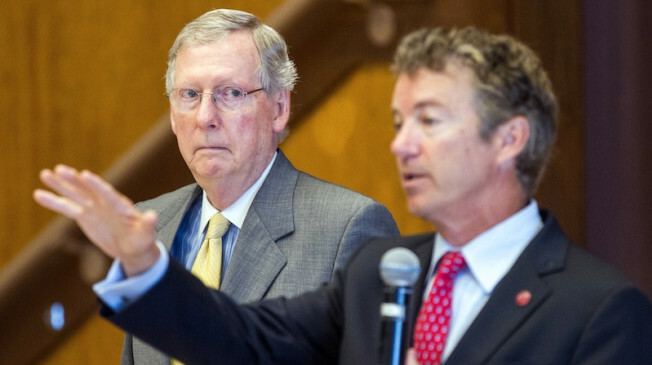 Hot Mic confirms Mitch McConnell and Rand Paul are extremely confident in their position as the Govt Shutdown grows in length. Talking Point Memeo reports Senate Minority Leader Mitch McConnell (R-KY) and Sen. Rand Paul (R-KY) were caught on a hot mic Wednesday night while discussing their party’s messaging on the government shutdown. Paul ran into McConnell, who was wired for an interview, in front of a camera after wrapping his own interview with CNN, according to Western Kentucky news station WPSD. “I just did CNN and I just go over and over again ‘We’re willing to compromise, we’re willing to negotiate.’ I think — I don’t think they poll tested ‘we won’t negotiate.’ I think it’s awful for them to say that over and over again,” Paul said of the Obama administration’s stance on the shutdown. “Yeah, I do too, and I just came back from that two hour meeting with them, and that was basically the same view privately as it was publicly,” McConnell said. President Barack Obama met with congressional leaders Wednesday night to discuss opening the federal government and raising the debt ceiling, but the meeting brought the two sides no closer to ending the budget impasse. In the video recording,: Paul was confident: that the GOP’s pivot from demanding Obamacare be defunded to seeking out compromise would succeed. “I think if we keep saying ‘We wanted to defund it. We fought for that but now we’re willing to compromise on this,’ I think they can’t — we’re gonna, I think — well I know we don’t want to be here, but we’re gonna win this I think,” he said. This confirms the GOP is confident while Democrats are getting nervous with each passing day. As the shutdown grows in length, the novelty of the story wears off and Americans go on living their lives. That’s not good for Democrats.